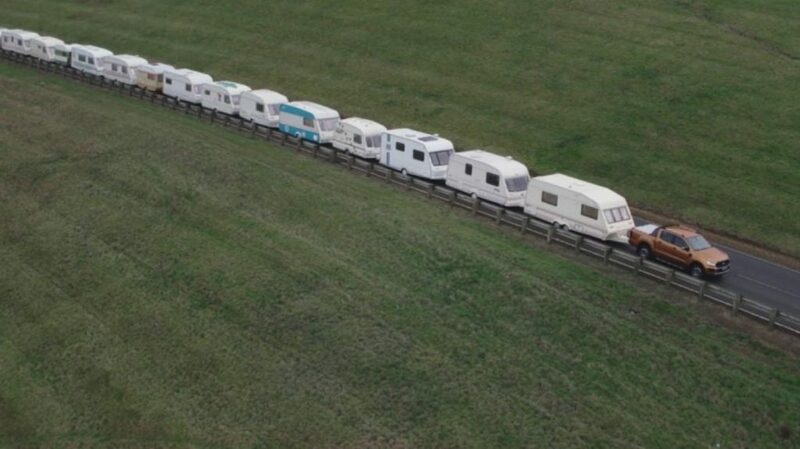 Case in point, the video has the Ford Ranger pulling 15 caravans all at once. The Euro-spec Ford Ranger in this video has a 3.5 tonne towing capacity thanks to 500 Nm of torque and 213 PS from a EcoBlue Bi-turbo engine. As you’ll see, it’s serious pulling power. The addition of a new 10-speed automatic transmission helps to get the caravan going. But we can’t say we’d endorse such a feat on public open roads. The film shows the Ranger effortlessly towing a 20-tonne convoy when a car suddenly approaches from behind. The driver of a German station wagon is anxious to overtake, but the driver of the Ranger waves the impatient traveler ahead. It then becomes apparent that there are quite a few caravans hitched to the Ford Ranger. Fifteen to be exact. “This was the slowest stunt I’ve ever done–but also one of the hardest. Trying to keep the caravans on the straight and narrow while the car drove past was a tough challenge, and one that really demonstrates the Ranger’s capabilities,” said precision driver Paul Swift. Swift was the brave driver behind the wheel of the Ranger. The caravans consisted of diverse models such as a 1950s Airstream, a hippy-themed caravan, and a caravan especially for dog lovers–complete with paw prints. We love the new Ranger and we aren’t alone. Consumers purchased 1,200 Ford Ranger trucks in January 2019, and to keep up with the booming demand for the truck, Ford added overtime shifts at its Michigan Assembly Plant. After seeing this film we are even more impressed by its ability to do things that are unnecessary and excessive. Because that’s what driving a truck is all about, right? For more information about the Ford Ranger, subscribe to Ford Authority. How stupid. Just because you can move something doesn’t mean you can stop it. Lots of people are injured trying to tow trailers way heavier than they should pull with a half ton. These people need educated that these car brake equipped trucks can’t stop 8-10 thousand pounds. Yes I know they have a brake controller but what if it stops working? Get over yourself Dave & Paul “lighten up” a bit. Hey come on, it’s excellent advertising. Hey Steve J How nice for you. That was kind of dumb. The real trick will be stopping this mess. I would like to see what it took to get this mess moving, not start with the thing rolling already. It’s got a bi-turbo diesel that”s capable of towing 3 1/2 ton load. go figure!! pulling under it’s own power.